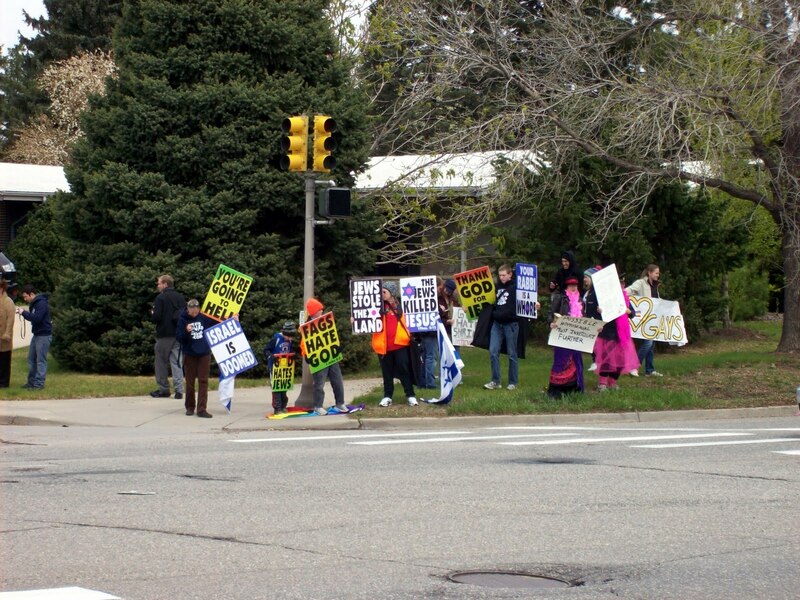 Today, members of the Westboro Baptist Church descended on the greater Denver area to protest various Jewish temples and synagogues, as well as a local Jewish community center. Apparently because the Jews killed Christ. Please note that bringing up the fact that the Romans killed Christ, or that Jesus himself was a Jew is beside the point and will not be addressed, lalala-I-can't-hear-you. 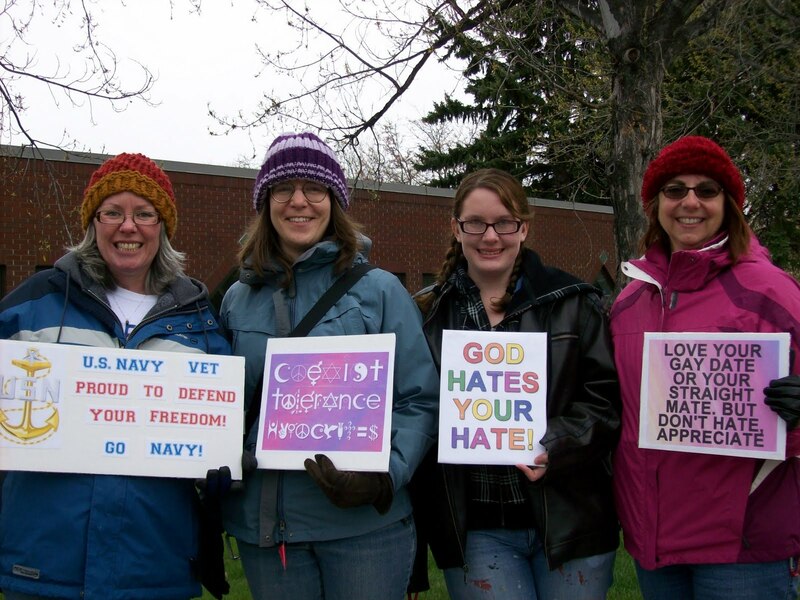 So in a show of solidarity, the Incomparable Anne™, our friend Stacey, and my very own Smart Girl headed out to counter-demonstrate the whackadoodles. Let me note here that, as usual, the WBC whackos were outnumbered by counter-protesters at all fifteen of their Denver stops, in some cases by a huge margin. Since it appeared that there was only eight of them (including the two children they brought - gotta bring 'em up right in the spirit of hatred and intolerance), this was not a difficult thing to do. Our first stop was Temple Sinai. 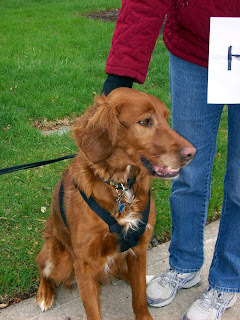 The whackadoodles were across the street from us, and we were lined up in front of the temple. The wind was blowing and it was cold, but a member of the Board of Directors came out to thank us for our support and offer us the use of their restrooms. I appreciated her coming out to speak to us, as the main reason I decided to go ahead and participate in the counter-demonstration was because I didn't want the Jewish community of Denver to think that the WBC targeting them for their hatefulness was in any way okay with the larger community. I'm glad we got that point across, and it made the experience really worthwhile. And we also made a new friend named "Godfrey." Godfrey apparently took the verse 1 John 4 quite literally, but believes there's a typo. It should actually read, "Godfrey is love." This was quite possibly the friendliest dog I have ever met. Then counter-protesters started crossing the street and holding their signs in front of the whackadoos (you can see a couple there on the right, in the pink Nazi outfits). Soon the counter-protesters started invading the whackos personal space, and the police ended up closing in to ensure things didn't get out of control. The end result of this strategy was that the whackos left the protest 15 minutes early and drove away in their minivan. I doubt we'll miss them, but I think I would have been happier if we could have kept the dividing line between "us and them" more firmly established. I did not cross the street, as I doubt the police would have let me off with a warning for punching them in the throat just because my dad was a peace officer. This was very true. Everyone we chatted with was there because they wanted to express their solidarity with the communities that had been targeted by these hate-mongers. 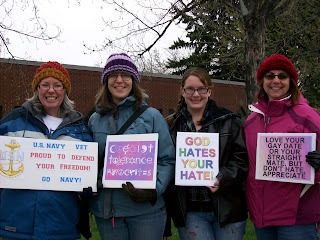 There were folks from every walk of life, every sexual orientation, every religious belief, every political persuasion. The one thing we had in common was a desire to show that Phelps and crew are the outliers in our communities, an in fact, aren't members of our communities AT ALL. You have a Typo! God Hates FIGS. 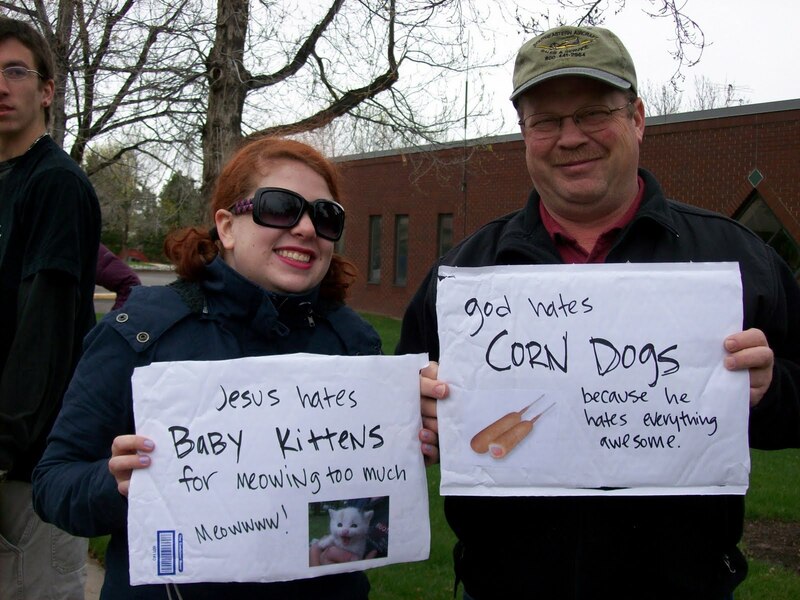 And my personal favorite: God Hates Shrimp! Leviticus 11:9-12. Off to see the Rockies in their second game of a double-header against the Marlins. Hurray for love, tolerance and solidarity! Sounds like you did some good today! Well done! I know I was a bit against this when you asked for advice on it: I'd like to say I'm happy to admit I was wrong. Send money, in the name of Westboro to the Gay Men's Health Crisis or similar. My favorite part of this post? The WBC sign that said "Jews Stole The Holy Land!" Awesome, Janiece, Anne. Awesome. Wish I was there with you. I am happy to have been part of this foursome. I am also happy to say that although I was conflicted about going, I am so glad I did. I am a tad disappointed I didn't get to see Janiece punch someone in the throat, but I fear I would have missed it anyway as we would have been standing back to back throat punching together. Thanks to Anne for being the 'voice of reason'. UCF Girl Power for the WIN!! I'm so glad you went! Thanks,, everyone. It was a thoroughly rewarding experience. I'm glad I went! Love the photos and the activity report. Thanks for linking this to Facebook or I would have missed it. Godfrey must come from a really good home. Mom, Godfrey's humans obviously took really good care of him, but he was a rescue dog. Which makes him doubly cool. Hahaha, we wanted to wear the most OBNOXIOUS pink crap we could find and it was worth it. Thor may love kittens, but I don't know if Godfrey would. And we all know Godfrey is Love, so that means cats are the work of the devil. Am Yisrael Chai. We Yehudim must stick together!